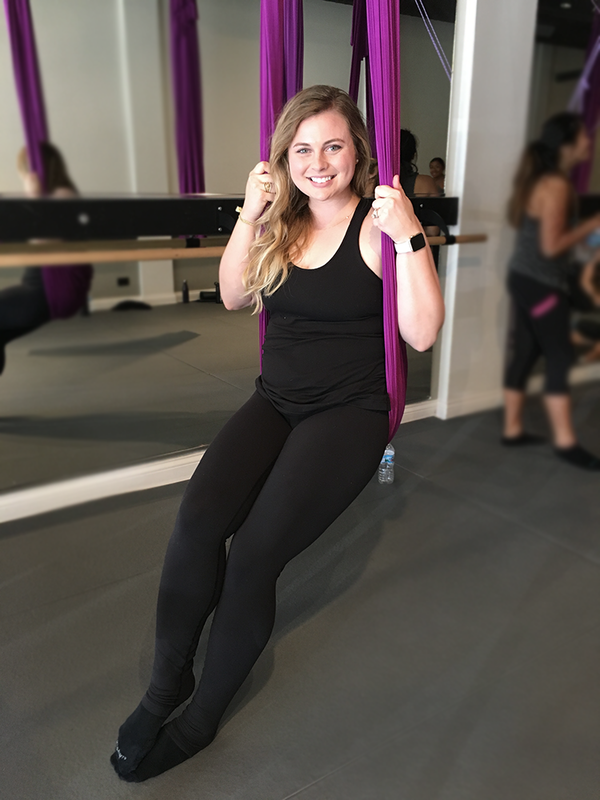 A few weeks ago we had a Pure Barre team bonding event where we took an aerial silks class at Yogi Barre and I had quite a few questions from friends and family about it, so I thought I would share my experience with you! Nervous doesn't even begin to describe how I felt the week leading up to the event. I can be pretty clumsy and even though I love new workouts, it generally takes a little bit of time for me to get used to moving my body in an unfamiliar way. I mean, we were going to be suspending ourselves from the ceiling using a silk. The closest I've ever been to that was hanging upside down on the monkey bars as a kid! The class started out with a bit of stretching using the silk (legs/lower body) and some hand exercises to warm up your wrists, fingers, etc. 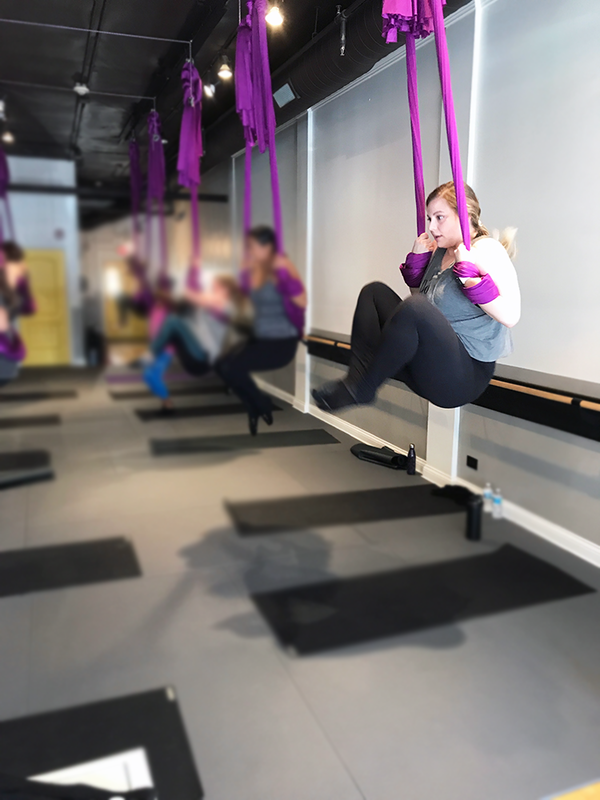 We all thought the hand exercises were a little bit silly at first, but I really underestimated how much you use those muscles to hold onto the silks! 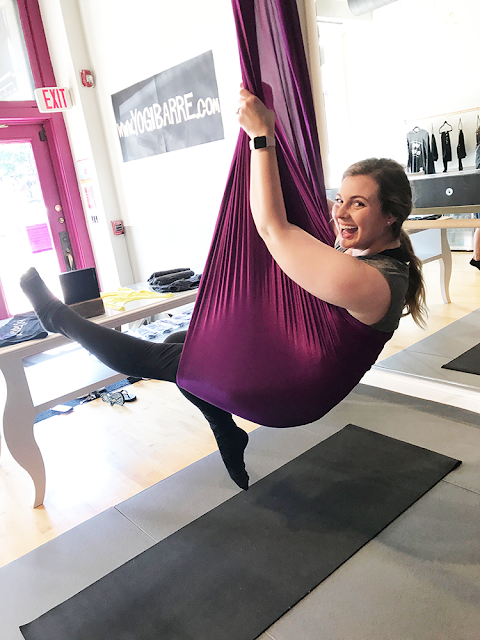 Once we were warmed up and stretched out we did some body weight exercises - tricep dips and knee ups using the silks. From there we moved on to the aerial part of the class where we used the silks to hold mostly yoga inspired positions. This was the trickiest part as it requires a lot of trust in yourself and the equipment and it was particularly hard for me as I have a real fear of falling from taking one too many express trips down the stairs as a kid! I was able to get myself into about half of the positions - the others I had a hard time because of my lack of flexibility in certain parts of my body and I started to get a little woozy from being upside down in the other positions. This wasn't an issue for some of my co-workers and they seriously looked like they belonged in Cirque Du Soleil! The particular studio we went to had 10 silks ranging in length. We also used a yoga mat, and although we did not use weights, some of their classes incorporate them along with the use of a barre. Choosing your silk can be a little difficult, but the ideal silk is one that hits you at the base of your seat which is important for properly getting into the positions. I also have to forewarn you that you will be hanging upside down, swinging, moving in ways you may not be used to doing and therefore if you easily get dizzy, have vertigo or motion sickness, this may not be the class for you! They do have motion sickness bands and ginger candy there in case you are unexpectedly hit with some dizziness and/or nausea. My biggest takeaway from this class is that I need to learn to trust my body. 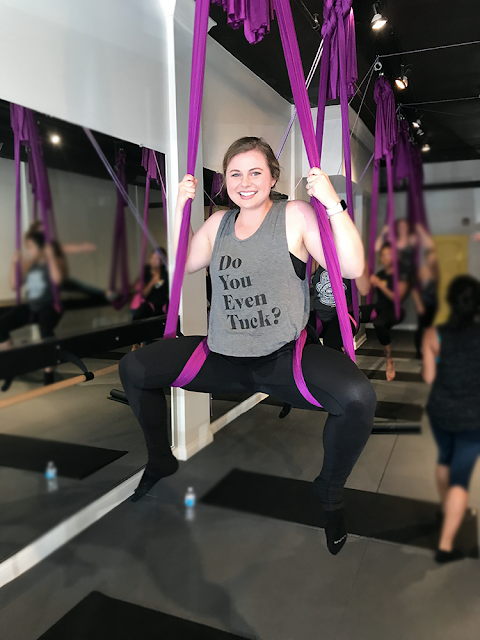 From the very beginning of the class I was questioning my ability to do a knee up while using the silks to support myself while I jumped, but you know what? I did it pretty easily and actually got some decent air! 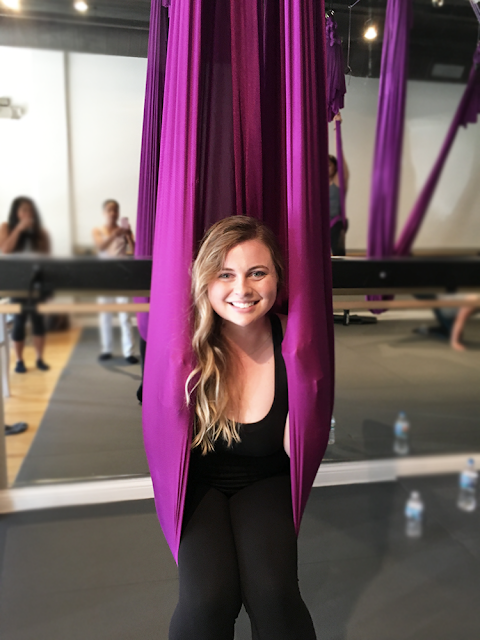 Overall I thought the class was really fun and perfect to try with friends if you're looking for something new or different to try out!